Copyright 2013 The Authors - The University is continuing to endeavour to trace the copyright owners and in the meantime this item has been reproduced here in good faith. We would be pleased to hear from the copyright owners. 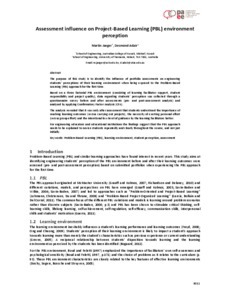 The purpose of this study is to identify the influence of portfolio assessments on engineering students’ perceptions of their learning environment when being exposed to the Problem‐Based Learning (PBL) approach for the first time. Based on a three factorial PBL environment (consisting of learning facilitator support, student responsibility and project quality), data regarding students’ perception was collected through a questionnaire survey before and after assessments (pre‐ and post‐assessment analysis) and analysed by applying Confirmatory Factor Analysis (CFA). The analysis revealed that it was only after assessment that students understood the importance of reaching learning outcomes (versus carrying out projects), the necessity of exerting personal effort (versus group effort) and the intentional low level of guidance by the learning facilitators better. For engineering educators and educational institutions the findings suggest that the PBL approach needs to be explained to novice students repeatedly and clearly throughout the course, and not just initially.